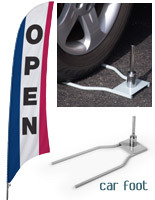 These stock message OPEN 13' outdoor flags feature a sturdy ground spike for secure mounting. The high visibility business advertising accessories attract street traffic and passersby. 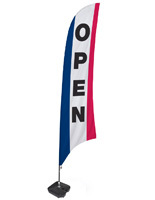 Each of these feather-style nylon "OPEN" 13' outdoor flags will withstand winds up to 20 mph. The eye-catching advertising fixtures have a red, white and blue striped design with bold black vertical lettering. 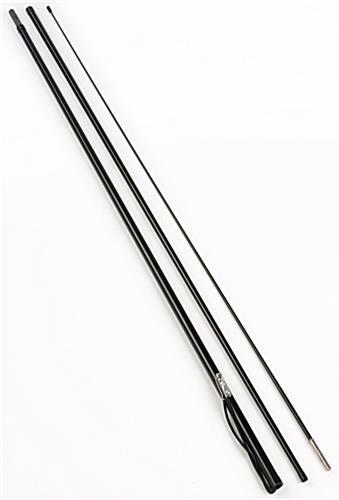 These OPEN 13' outdoor flags with ground stake are easy to install and move as often as needed. High visibility advertising banners are ideal choices for attracting customers during business operating hours. Please Note: These banners are NOT designed to be used in winds exceeding 20 mph. Doing so may cause the unit to become damaged or unstable.